Heart attacks occur when a narrowed artery becomes completely blocked which cuts off the blood supply to the muscle of the heart past the blockage. This doesn't occur by progressive fat deposition in itself leading to total occlussion of the artery. Pathological (post-mortem) studies looking at the arteries of people who have died from heart attacks have shown that this occurs most often because of blood clots forming in the already narrowed in the artery. 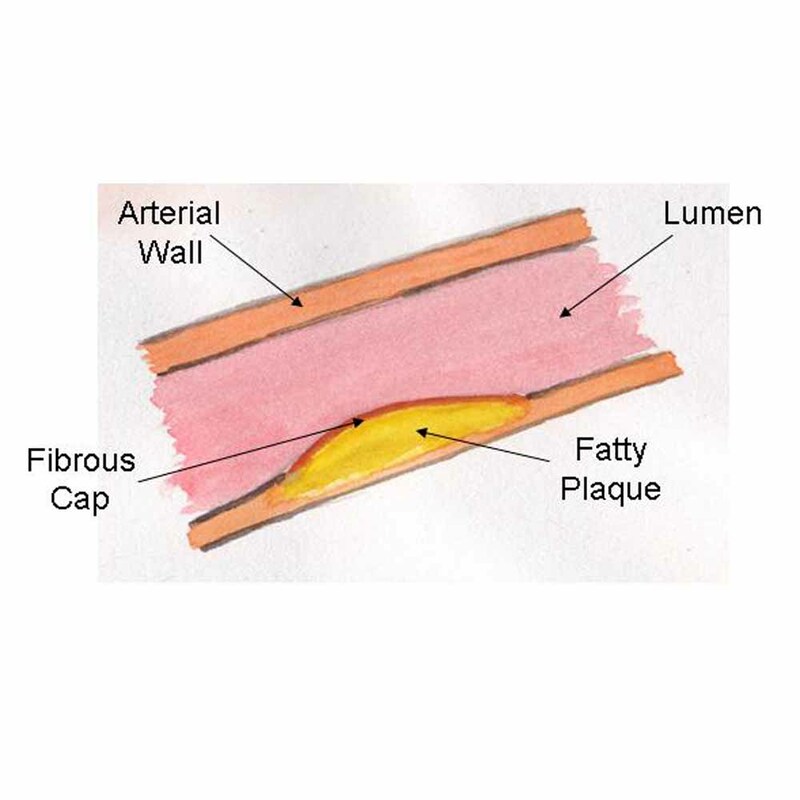 This seems to happen because the fat in the wall of the artery appears to lead to a lot of inflammatory activity and this can lead to the fibrous cap covering the plaque fissuring (splitting) releasing the soft fatty material below into the lumen of the artery. The fatty material within the blood stream causes the blood to clot and this clot blocks the artery preventing blood flow. 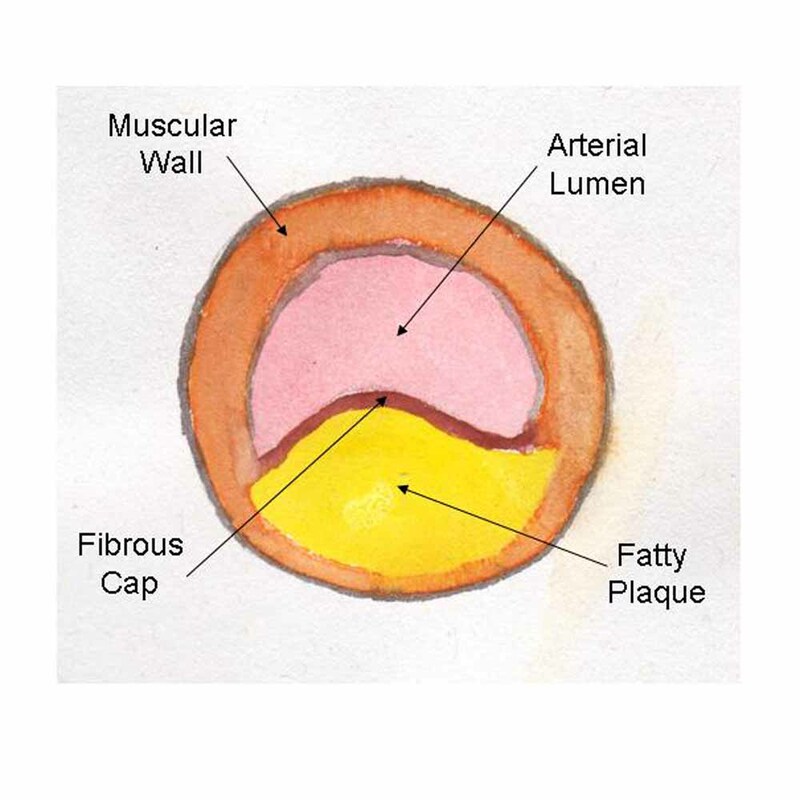 As the deposit of fat grows in size it progressively reduces the effective lumen of the artery. 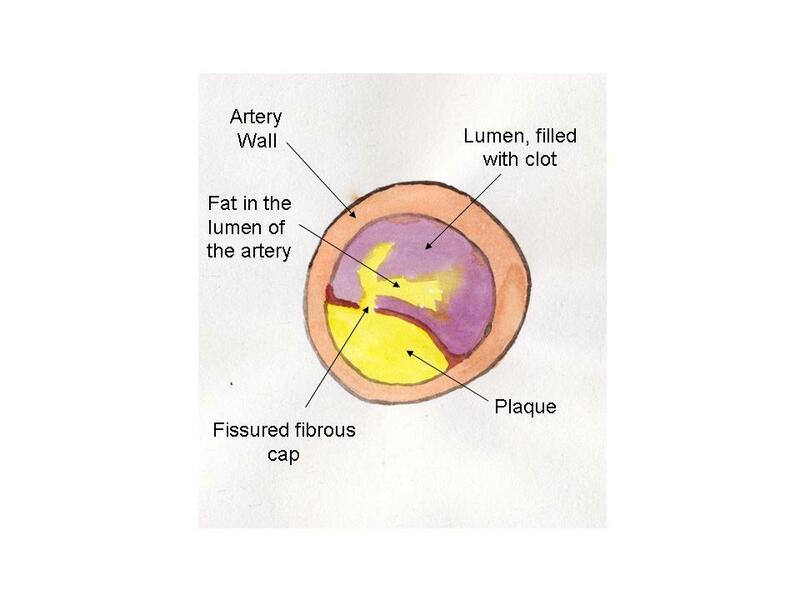 It is separated from the blood in the artery by a layer of tissue called the fibrous cap. 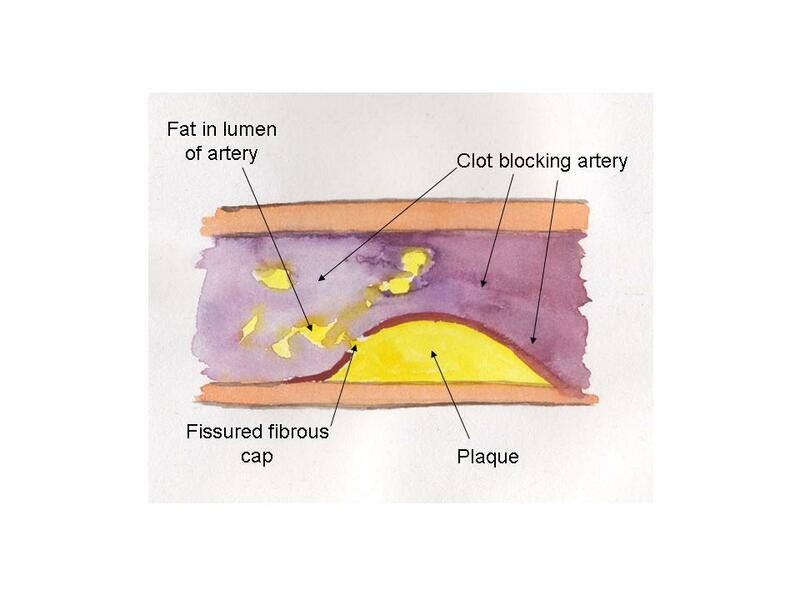 If the fibrous cap covering the fatty plaque ruptures (fissures) then the fatty material can escape into the lumen of the artery. Here clotting elements within the blood are stimulated and a thrombus (clot) can form which blocks the artery causing loss of blood flow to the myocardium (muscle of the heart) past the clot. This may cause death of the muscle which is the definition of a heart attack. If the muscle past the blocked artery cannot get its blood supply through other blood vessels flowing around the blockage then it will be deprived of its oxygen and will die eventually turning into dead tissue over the succeeding minutes and hours which in time will be replaced by scar tissue. Unlike angina, which is usually provoked by increased work loads on the heart, heart attacks often come on completely out of the blue. The nature of the pain is very similar to that in angina being a tight, crushing, central chest pain but it can be very much more severe. It also tends to persist and untreated may last for an hour or more rather than a few minutes as with angina. Heart attacks are principally diagnosed on the basis of the patient's symptoms, the electrocardiogram (ECG) and the release of biochemical markers from the damaged heart muscle into the blood stream (blood tests for what are called cardiac enzymes). The symptoms of a heart attack can be very similar to a severe angina attack. Typically however the symptoms come on at rest rather than with exertion. Typically patients will experience a pain in the centre of their chest behind the sternum. Often this will be described as 'heavy', 'crushing', 'like a band', 'a heavy weight' and there may associated feelings of nausea, sweating or breathlessness. The pain may radiate out into the left arm or up into the throat or lower jaw. The pain is often severe but interestingly some patients experience very little discomfort and occasionally doctors come across patients who have clearly had heart attacks but have no recollection of any symptoms that might indicate when this might have occurred. Whilst in many patients the diagnosis is easy, equally in many others it is actually quite difficult. Not all patients experience the same kind of pain and even in those with typically cardiac sounding pain it is not always easy to differentiate between a severe angina attack and a heart attack. The ECG changes may not occur immediately at the onset of the heart attack but may progress over time. In an ST segment elevation heart attack (STEMI) the changes are relatively easily recognisable (although even here other conditions such a pericarditis can be confused with a heart attack). In non-ST elevation heart attacks (NSTEMI) as the ECG changes are very similar to those seen in angina the diagnosis is only often confirmed later when the blood tests become available. Another problem in the early diagnosis of a heart attack may be pre-existing changes in the patient's ECG caused by previous heart attacks or conduction abnormalities (particularly LBBB; left bundle branch block) which may make it difficult to determine whether the current symtoms represent a new cardiac event. The upper illustration is of a normal twelve lead ECG with an expanded view of two of the leads (V5 & V6). It can be seen that the ST segments lie on the same line as the parts of the ECG between the T-waves and the p-waves. Whilst these newer biochemical markers of cardiac muscle damage (Troponins) are extremely sensitive to myocardial ischaemia (critically reduced oxygen supply to the muscle cells) and cell death (myocardial infarction) they can also be elevated in circumstances other than heart attack or acute coronary syndrome (for instance heart rhythm disturbances, pulmonary embolism, severe infections, reduced renal function......). The accurate diagnosis of heart attack is important. First, patients with STEMI's (ST segment Elevation Myocardial Infarction) have a higher survival rate if treated promptly with either thrombolytic drugs or primary angioplasty and therefore the diagnosis needs to be made before the blood results are usually available. Second, medications such as Aspirin, Clopidogrel and Clexane improve the outlook in both STEMI and NSTEMI (Non-ST segment Myocardial Infarction) patients. Equally, however, mis-diagnosing someone with a heart attack may not only have the consequence of them receiving unecessary medications and possible side effects from them, but may also have long-lasting financial and social consequences in terms of employment potential or when they later try to get travel insurance, mortgage protection, life insurance etc. The two main early aims of treating people who are having heart attacks is first to relieve the pain and anxiety and second to try to re-establish blood flow down the coronary artery as soon as possible thereby minimising the damage to the muscle of the heart wall. Following the initial treatment it is important to care for the patient in an environment where any of the potential complications of a heart attack will be recognised early and treated appropriately. This will often be in a coronary care unit. Patients who have symptoms suggestive of a heart attack are advised to phone 999 and they will be admitted to hospital as an emergency where they can be assessed. If it is felt that they are having a heart attack on the basis of their symptoms and ECG changes then the treatment will be determined by the type of heart attack that they are having. All patients might expect to be given Morphine to relieve pain and anxiety and Aspirin, Clopidogrel and Clexane which are drugs which help to reduce the clotting of the blood. These drugs have been shown to improve survival from heart attacks. Lots of research has been carried out into the nature of heart attacks over the past few years. This has shown that whilst nearly all heart attacks are caused by blocking of the coronary arteries this produces different types of heart attcks in different people. These are split into two different types according to the changes that are seen on the ECG. The ECG changes that are used to characterise the type of heart attack depend on an area of the ECG called the ST segment and are split into those where the ECG changes are characterised by an elevation of the ST segment and those that are not. These are known as ST segment elevation myocardial infarctions (STEMI's) and non-ST segment elevation myocardial infarctions (NSTEMI's) respectively. Research has shown that the best initial treatments for these two types of heart attacks are slightly different. ST segment elevation myocardial infarctions are best treated by early attempts to try and re-establish blood flow down the arteries with clot busting drugs (thrombolytics) or very early angioplasty (primary percutaneous intervention; PPCI). Non-ST segment elevation myocardial infarctions are best treated by aggressive medical management with drugs but survival is not improved by immediate re-opening of the artery by thrombolysis or PPCI. Following the initial presentation and early treatment of the heart attack which will depend on whether it is an STEMI or NSTEMI, most people will be treated in very similar ways. It is important to identify and correct any ongoing significant risk factors. If the patient is a smoker it is very important that they stop. Continuing to smoke is associated with a much increased risk of further heart attacks and premature death. This is probably due to a number of factors but smoking definitely makes the blood more likely to clot (by increasing the amount of fibrinogen), it causes the coronary arteries to be narrower by the nicotine stimulating the muscles around the artery and it means that the blood is carrying less oxygen because the smoke contains carbon monoxide which becomes stuck to some of the haemoglobin preventing it from carrying oxygen. As can be seen this means that less oxygenated blood is flowing slower down narrower arteries and the blood is also more likely to clot thereby blocking an artery! Not smoking really does make a difference. Diabetic patients may need to come off their current tablets and go on insulin for a short while if they have a heart attack and it is also very important to try to control their diabetes as tightly as possible to reduce the risk of further heart attacks. Patients admitted with unstable angina, NSTEMI's and STEMI's will also be prescribed Clopidogrel (Plavix) for a period of time after their admission as well, and the length of time will depend on the exact diagnosis.